Albert Einstein predicted in 1916, the existence of gravitational waves. Gravitational waves can be described as ripples in the fabric of space-time. These waves are just like sound waves but are a bit more complicated. Sound waves use air as the medium from where it travels. Gravitational waves travel as compressions and expansions of the fabric of space time. They may be pictured as small distortions or ripples of space-time geometry which propagate through space as waves. A slight distortion in one region of space distorts nearby regions, and in the end, there is a moving distortion which speeds along at the the speed of light. Gravitational waves can be pictured as the indentations surrounding a bowling ball as it rolls forward in a bed or mattress. Just like that, Einstein theorizes that the dimension of space-time warps and curves as planets and other objects of big masses move along it. These curvatures generate ripples (waves) in space-time that travel outward at the speed of light and diminishes in energy as it goes further out. This is what a gravitational wave is. Gravitional waves have not yet been discovered but there are indirect evidence pointing to its existence. In order to prove that they exist, these must be observed and measured. For 20 years, the Explorer Gravitational Wave Detector at CERN have been trying to detect this wave. 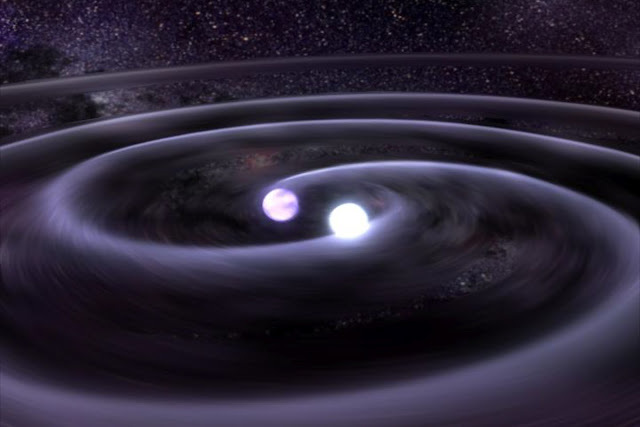 This is an artist's conception of J0651 with ripples to demonstrate how the white dwarf pair is emitting gravitational waves. Gravitational waves, much like the recently discovered Higgs boson, are notoriously difficult to observe. Scientists first detected these ripples in the fabric of space-time indirectly, using radio signals from a pulsar-neutron star binary system. The find, which required exquisitely accurate timing of the radio signals, garnered its discoverers a Nobel Prize. Now a team of astronomers has detected the same effect at optical wavelengths, in light from a pair of eclipsing white dwarf stars. "This result marks one of the cleanest and strongest detections of the effect of gravitational waves," said team member Warren Brown of the Smithsonian Astrophysical Observatory (SAO). The team discovered the white dwarf pair last year. (White dwarfs are the remnant cores of stars like our Sun.) The system, called SDSS J065133.338+284423.37 (J0651 for short), contains two white dwarf stars so close together -- one-third of the Earth-moon distance -- that they make a complete orbit in less than 13 minutes. "Every six minutes the stars in J0651 eclipse each other as seen from Earth, which makes for an unparalleled and accurate clock some 3,000 light-years away," said study lead author J.J. Hermes, a graduate student working with Professor Don Winget at The University of Texas at Austin. Einstein's theory of general relativity predicts that moving objects create subtle ripples in the fabric of space-time, called gravitational waves. Gravitational waves should carry away energy, causing the stars to inch closer together and orbit each other faster and faster. The team was able to detect this effect in J0651. "Compared to April 2011, when we discovered this object, the eclipses now happen six seconds sooner than expected," said team member Mukremin Kilic of The University of Oklahoma. "This is a general relativistic effect you could measure with a wrist watch," added SAO's Warren Brown. J0651 will provide an opportunity to compare future direct, space-based detection of gravitational waves with those inferred from the orbital decay, providing important benchmark tests of our understanding of the workings of gravity. The team expects that the period will shrink more and more each year, with eclipses happening more than 20 seconds sooner than otherwise expected by May 2013. The stars will eventually merge, in two million years. Future observations will continue to measure the orbital decay of this system, and attempt to understand how tides affect the merger of such stars.